One area that search engines have made a number of significant advancements in recent years is in how they evaluate content on a website. So what does a perfectly optimized page look like in 2012? Let’s look at 10 elements. 1. Title tags are still important, but it’s not a good idea to over-optimize them. 2. Descriptions still don’t appear to add much ranking value, but can help encourage clicks. 3. Header tags still need to be relevant. 4. URL still ideally mentions the keywords. 5. Content is now about semantically relevant supporting keywords, not multiple mentions of the keywords. The example chosen is a recipe, because in order to make béarnaise sauce there are specific ingredients that are 100 percent relevant to the eventual outcome. One way of checking what keywords Google might consider as relevant is to do a ‘~keyword’ (or tilde) search. Other ways, let’s be honest, involve nothing more than common sense and knowing your subject. 6. Video and other ‘rich’ content can be useful on a page to increase engagement levels, reduce bounce rates and also to appear alongside results as illustrated. 7. Internal links need to follow the “reasonable surfer” patent. 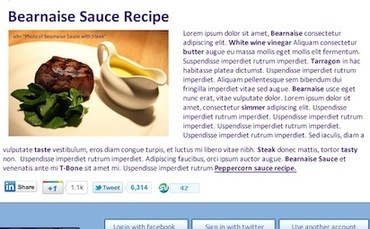 It makes sense in the “perfectly optimized page” example above to link to peppercorn sauce as an alternative to béarnaise. 8. Facebook/Twitter/other login comments are a way of sharing the content on other platforms. The direct SEO benefit may be debatable, but it never hurts to get your content in front of a large amount of people. With Google Search Plus Your World, it could be that adding a Google+ login is more important than anything else. 9. User reviews add regular content to the page, which can also be coded to include microformatting instructions and add extra elements to your listings in search engine result pages (SERPs). 10. Newsfeeds only share content that already exists elsewhere, but they contribute to an overall impression of the page changing on a regular basis. It’s worth noting that the “perfectly optimized page” above won’t be perfect for all verticals, or for all brands – not everyone has the ability to add customer reviews to their product pages (e.g., insurance comparison sites). Although there’s no one-size-fits-all solution, hopefully the above list will give you some guidance on how to perfect your on-page SEO.